1. Banned completely - all numbers with predominant rhythm, insufficient melody, or other unsuitable characteristics. 2. Banned Completely - numbers that are lethargic or unsuited to any speeding up of tempo. 3 Banned completely - all modern slow waltzes , due to their soporific tendencies. There was also a long list of pieces that were deemed unsuitable for one reason or another, such as 'Deep in the Heart of Texas' which has a clapping motif, which it was felt would encourage workers to bang their spanners on the machinery, possibly doing damage! The first programme was on Sunday 23rd. June 1940 and was played by Dudley Beaven at the theatre organ with the afternoon edition provided by a trio called The Organolists, which in later years evolved as Jimmy Leach and his Organolians who, in fact played the final edition in September 1967, some 16781 editions later! 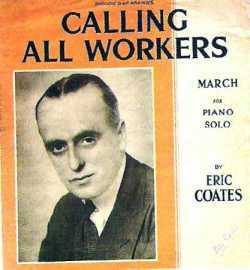 Initially, the programme had no signature tune, but light music composer Eric Coates had just written a march called 'Calling All Workers' and this was adopted as the signature tune from October 1940. Orchestra leader Wynford Reynolds was appointed 'Music While You Work Organiser' in 1941 and one of his tasks was to visit factories around the country, ascertaining workers' opinions on the programmes and, more importantly, the suitability of the contributing musical combinations. Pizzicato violin playing was outlawed (because it was inaudible) as were 'over fussy' arrangements that were likely to obscure the clear cut melody line - an essential requirement that also led to the exclusion of jazz. The programme featured ballroom dance orchestras, light orchestras, brass and military bands, small instrumental ensembles and (initially) cinema organs, but these were eventually phased out because it was felt that their tone was incompatible with factory conditions. Although nearly 500 musical combinations were featured over the years, some 60 only appeared once, because they were found unsuitable, sometimes for what one might consider petty reasons. For example, bandleader Ken Mackintosh was dropped after just one show because his drummer played too many 'rim shots' - which apparently sounded like gunfire over factory tannoys! Incidentally, the BBC considered it part of their brief to advise factory managers as to the most suitable sound reproduction equipment. 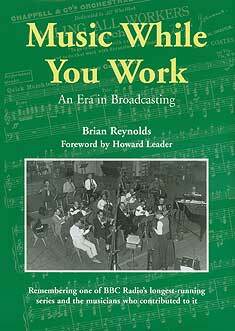 During the war, many factories were in production throughout the night (particularly munitions), so a third edition of 'Music While You Work' was introduced in 1942, at 10.30 pm. for the night shift. This lasted for the duration of the war, but was reintroduced between 1947 and 1950 - but in an early evening slot. BBC executives were quite sure that MWYW had helped to win the war - there was apparently a 13% increase in production during the times of transmission ! Although primarily intended as a morale booster for industry, MWYW proved very popular with domestic listeners, regularly achieving an audience of four million. To this must be added its 'captive audience' in the factories and, by the fifties, the burgeoning number of motorists who found it an ideal accompaniment. It was certainly very different to the 'boom-thud' cachophany emitted from many cars today ! Over the years some once very famous names appeared on the programme: Mantovani, Victor Silvester, Frank Chacksfield, Harry Leader, Lew Stone, Joe Loss - to name a few. The most popular combinations got the most broadcasts with Troise and his Banjoliers (in later years directed by Jack Mandel) doing an amazing 476 shows, with Cecil Norman and the Rhythm Players coming a close second with 466 editions. For most of its run, MWYW featured a weekly (sometimes twice-weekly) slot for brass and military bands - including all the Guards bands, the Royal Artillery, the Royal Engineers and the R.A.F. Central Band amongst others. Famous names from the brass band world - Black Dyke, Grimethorpe Colliery were just two of the many top bands included. From the light orchestral world, popular contributors were Ronnie Munro, Bernard Monshin, Harold Collins and Anton and his Orchestra. From the dance band world, Phil Tate, Tommy Kinsman, Jack White, Syd Dean and Bill Savill will be remembered by many people. The popularity of 'Music While You Work' in the post-war years led to the afternoon editions being extended to forty-five minutes. Many of the dance bands found this quite arduous, as brass players often found it difficult to maintain their 'embouchure' for long periods, their lips becoming quite tired towards the end of the programme. It has to be remembered that it was a requirement of the programme that the music should be continuous, so if a band wanted to have more than about three seconds between numbers, a piano or celeste link had to be inserted. Quite a number of combinations adopted this in later years - as it not only gave them more time to change their music, but had the additional advantage of effecting a modulation between numbers. If there was no link, the conductor had to ensure, when planning his programme, then the key of each piece was compatible with the key of the closing notes of the preceding piece. A delightful characteristic of the programme was that you could often hear the frantic rustling of manuscript paper between numbers! 'Music While You Work' was broadcast live until the Summer of 1963, after which time, most programmes were pre-recorded - usually the previous day and often in the evenings. This enabled more studios to be free for other programmes during the daytime. When the Saturday morning show was discontinued in 1964, it proved to be the 'thin edge of the wedge', as in 1966, the afternoon editions ended. The final edition of MWYW was broadcast on 29th. September 1967 - the last day of the Light Programme. It was revived for a week in October 1982, as part of the BBC's Diamond Jubilee Celebrations. It proved to be so successful that the programme was reinstated on a daily basis on 4th January 1983 - running for over a year! Further short revivals took place in 1990 and 1991 with a final 'one-off' programme in 1995, played by the Victor Silvester Orchestra. As a footnote, it should be mentioned that Radio Three broadcast a live edition of 'Music While You Work' on 24th June 2011 as part of their otherwise excellent light music festival entitled 'Light Fantastic'. Apparently confusing it with 'Workers'Playtime' they staged it in a factory near Manchester in front of an audience of workers, who had been given time off to hear it. The 90-piece BBC Philharmonic Orchestra, conducted by Stephen Bell even donned high-visibility jackets for the occasion. Unfortunately, those responsible had obviously never heard the programme which, instead of being non-stop light music as was traditional, was interrupted by applause and announcements. It also included several items that would never have been considered suitable for the series. It is sad that there is probably nobody left at the BBC who remembers the show and even sadder that they seemingly lacked the initiative to listen to the preserved editions in their own Sound Archives - or indeed, the many examples on this site! Here is a selection of bands and orchestras who played on the programme. The stirring theme tune was called Calling All Workers by Eric Coates and is available on Guild Music CD GLCD5128. Many editions of Music While You Work and countless other programmes are available for hire to members of O.R.C.A (Old time Radio-programmme Collectors' Association). Membership details from O.R.C.A. P.O. Box 1922, Dronfield, Sheffield S18 8XA or by e-mailing graemeotr@yahoo.co.uk.